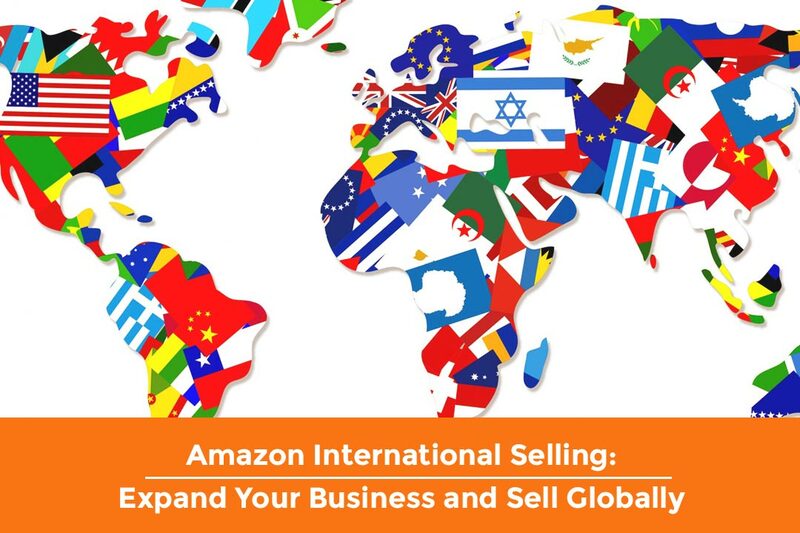 People who want to expand or even start with Amazon international selling often find themselves in a tricky situation. With the excitement also come fears of things like shipping delays, credit-card frauds and a whole bunch of other things. But selling internationally on Amazon is not as risky as many people believe and with the right strategy, selling through Amazon’s international marketplaces can be very rewarding. – Are you getting product inquiries from customers abroad? – Is your business facing slow or inefficient growth in the domestic market? – Are you selling a unique product, which can fill a void in a particular market? – Do you have a competitive advantage or business incentive which can help differentiate your product from the competitors? – Are you experiencing solid and sustainable growth in the home market? If the answer to the above question(s) is yes, then it’s the right time to start thinking about expanding your business globally. But the question still remains “how”, let’s find out. Amazon has its presence in 11 countries i.e. US, Canada, Mexico, UK, Germany, France, Italy, Spain, Japan, China and India, offering a huge growth potential for businesses. With 11 global marketplaces, 109 fulfillment centers, 30 global listing categories and buying customers in 180 countries, Amazon international marketplaces are the perfect platform for sellers to introduce their products to millions of new customers worldwide. Registering with Amazon international seller accounts to sell in these marketplaces allows you immediate access to customers who prefer the Amazon buying experience. You don’t need to worry about most of the costs, time and other tedious operations related to setting up your own business in a foreign country, compared to selling it through Amazon. If you have not registered with Amazon as a professional seller, the first step is to register a new account. Although in most cases Amazon processes the registration applications in very little time, sometimes the process can take much longer depending upon various reasons, including the type of product you are selling and the target marketplace. If you think you’ll be able to sell 35+ items/month, go for the Pro account as it offers more features and benefits than a basic account, but comes with a monthly subscription fee. You can create and manage product listings from a single seller-account for the United States, Canada and Mexico. If you are already selling in the US, expanding your business to Canada first, should be an easy thing to do as you can list your products in English. Canada is a rapidly growing online marketplace and offers huge potential for prospective sellers. You also have the option of selling your products through FBA in Canada, while Amazon can also convert your sales to the US $ and transfer money directly to your US Bank Account. However, you need to properly label SKUs meant for Canada otherwise issues may arise in Amazon’s inventory system. However, FBA quantity would not be shared between the three countries and a seller cannot fulfill FBA orders with stock held in another country. This means you’ll have to maintain separate inventories for each country. You also have to issue different SKUs for each country e.g. for Canadian FBA inventory, you need to add ‘-CA’ at the end of the current SKU. Just like the NAUA (North America Unified Account), you can also reach European customers in the UK, France, Germany, Italy and Spain using a single EFN account with an added advantage of sharing the FBA quantity between different countries. This means you can list your products on multiple Amazon EU sites like Amazon.fr, Amazon.co.uk, and Amazon.de using a single pool of inventory. All you need to do is to list the product in the local language of a marketplace and you are good to go. You ship your products to Amazon fulfillment centers in the UK where they are stored for fulfilling orders from any EU marketplace with customers in the UK having fast delivery options. A local fulfillment fee is applicable when you are selling on Amazon UK, while a cross-border EFN fee is also applicable when selling to the customers of other EU marketplaces. You can also ship and store your inventory to any specific EU marketplaces for fast delivery options to a particular country. After your Amazon international account is setup, listing your products should be a standard affair. The Seller Central provides a tool to set up international listings using existing domestic listings. Amazon even helps in determining the appropriate price in case currencies fluctuate and also assists (at a nominal fee) in translating your product description into other languages, including German, French, Spanish and Italian. Fulfillment by Amazon helps you by doing all the tedious stuff related to operations, including shipping, stocking and handling customer service. Once you have delivered your items to Amazon Fulfillment Centers, it becomes its responsibility to hold and ship the items to customers and handle their queries. FBA products also automatically qualify for Amazon Prime, which offers quick shipping of the product to its Prime customers. Using FBA also gives your items prominence in the Amazon search results and allows tapping Prime members, who spend around twice as much as an average shopper. However, Amazon charges around 30% of the sale price for using FBA and it may not be financially feasible to put all your eggs in one basket. The better strategy is to use FBA for selling high-margin & best-selling items. When using FBA it makes it easy to fulfill your products to other countries as well. When selling in the Amazon international marketplaces such as in the European marketplaces for example, you can choose to make your product available in all EU countries as well. Thus giving you the potential of reaching additional customers in countries were Amazon doesn’t have it’s own marketplace (yet). You may not yet have all the skills and experience required to run a successful international Amazon business, but there are a number of tools and services available to help you out. The important thing to remember is that there is a solution to every problem and challenge you may come across. Calculating taxes can often become a complex task when you are expanding your business internationally. The good news is that there are a number of tax advisory services available, which can take the pain of dealing with taxes so you can focus more on expanding your business. Banks are not known for offering services that e-commerce businesses need to expand internationally and their foreign exchange rates are also usually not competitive. This is where foreign exchange services can be really helpful as not only they help you deal in multiple currencies, they also offer preferential exchange rates. These specialist firms can directly collect the money overseas without requiring you to have a bank account and pay the suppliers on your behalf. Replying to customer’s queries in a foreign language can be the trickiest part of doing business overseas, and considering the fact that Amazon expects you to reply within a limited time, pressure can quickly build up. If you are using FBA, then you a lot less to worry about, but otherwise, you will need professional help of companies that provide specialized services to deal with foreign customers or hire your own stuff, something we will be able to help you with. You need your listings to be well-written in order to attract foreign customers and although Amazon can also help you in this regard, it’s not enough to just translate the listing, but also researching the best keywords and copy by a native speaker and creating a listing that not only sounds natural in the language you’re targeting but is also using the specific words people in that country will use to describe and search for your product. This is something our native account managers & copywriters will be able to help you with. Offshore-returns is another area that worries people looking to expand their business, especially for low-value items. One of the solutions for dealing with low-value items, which can cost as much as re-shipping cost, is to simply write it off, but buyers are suspected to order thinking they’ll get it for free. Another way to minimize loss is to engage a firm to take returns and then resell it in their local market. This should help you cover most of the return-related costs and you can find many companies in different countries that can help you do so. Dealing with multiple currencies, taxes, bank accounts and most importantly frauds are some of the financial issues that you’ll need to deal with as you move along. As discussed earlier, most of these issues can easily be dealt with by outsourcing specialist services, but how do you manage fraud? Although due diligence cannot guarantee 100% fraud-free business, it does minimizes the risks associated with selling internationally and if you opt for FBA, chances of any mishaps are further reduced. Complying with Amazon’s guidelines for packaging and labeling is very important otherwise, it may lead to inventory issues. Different countries have their own tax laws, for example, many find VAT in the UK troublesome. It’s better to start in small quantities using FBA in the beginning and move along accordingly. You also need to consider if you are going to charge customers for any additional charges or fees e.g. 20% VAT in the UK. VAT is the amount tax authorities collect on the final sale, which is something tax authorities are very proactive about. Other issues including customer services, returns and pricing have already been discussed earlier and need to be considered before laying out a strategy for business expansion. Although Amazon handles most of the workload when you are selling through FBA, there may still be instances when you’ll need a native or fluent speaker of the local language to address customer issues. This is where you’ll need the help of a company specialized in dealing with local customers or someone who can communicate on your behalf. In the beginning, it’s better to focus on one international market instead of targeting all at once. This will give you some space and time to rethink your strategies and allow you to focus on marketplaces that are potentially most profitable. That’s simply not true as you’ll have to figure out many things all by yourself like dealing with VAT on top of Amazon’s commission and issues using the EUN (European Fulfillment Network). Properly translating your listings, setting up payment methods etc. are some of the other things that you may need professional help for. Don’t let steady sales abroad distract you from the fact that once other charges like VAT and higher shipping rates apply, the game may change overnight. Customers may look for other options after seeing VAT and other charges applied on items, while you also have to consider return costs if you have used FBA as you’ll have to pay for it. Instead of trying different things yourself and spending a lot of time and energy, it’s better to hire professional services of experts, who are able to guide you about particular items more effectively. Although Canada and UK marketplaces are easier to enter, they may not be the most profitable. Depending upon the kind of product you are selling, there may be a greater demand for your products elsewhere like Japan. An in-depth market analysis is the key to determining if you should go for paying higher taxes and fees in the UK or explore markets like Japan, which obviously requires more effort and time. Translating product listing in the native language isn’t the only thing as you also need to relate your products to the customers, inspiring trust and familiarity. Product descriptions need to target customers on a personal level instead of just generic specifications and details. This guide aims to provide a starting point for sellers looking to expand their businesses internationally. There are so many other things that you’ll learn with time, but the important thing to remember is that international marketplaces can prove to be very profitable, provided you are willing to invest time and effort to build a truly international Amazon business. Fulfillment by Amazon can prove to be very helpful in the beginning as it gives you an idea if the demand of your products really exists in a particular marketplace. Start with smaller quantities and move along slowly to avoid unnecessary risks. Amazon’s unified European Fulfillment Network is an excellent option if you want to sell your items in large quantities across multiple marketplaces using a single account. But you need to be careful about product pricing, considering VAT and other associated fees. One the other hand, the Canadian marketplace is also expanding rapidly and offers a lot of potential, particularly for sellers from the US. New sellers looking to expand internationally are often worried about frauds, but there will be some people trying to cheat the system whether you are in the US or elsewhere. You may be surprised to know that there are more US citizens than foreign customers trying to cheat. Amazon international selling comes with its own set of rewards, and although you may find it tough at times, over the long-term selling internationally is worth it and there aren’t many reasons that should hold you back from going global.